for meditation, affirmations and self-growth. Linda Ewashina believes the medicine wheel teaches the sacred connection to all of creation – “of the interwoven fabric of Creation that links us with all our relations”. She had been studying the medicine wheel for several years when she chanced upon Jody Bergsma’s visionary artwork. From Jody’s collection of paintings came the images for the Spirit of the Wheel deck, each image of myth and nature chosen for the perfect way they reflected the symbols and energies of the medicine wheel. The 40 cards of the deck represent the 37 traditional, individual stones on the medicine wheel and their meanings on the wheel, plus the three extra ‘power stones’: Stone of Self, Stone of the Ancestors, Stone of the Great Star Nation. They are (very) roughly grouped into celestial spirits like Mother Earth and Father Sun; animal clans like the Turtle Clan; directions (North/South/East/West); the power stones; moon names such as Harvest Moon, and positive qualities like Purity and Illumination. They’re illustrated with animals and scenes of North American nature – deer, frogs, birds, bears, mountain lions, and a few people - in an idealised and mythical style. Measuring 3.375 x 4.75 inches, the cards are larger than usual but small enough to shuffle. They’re packaged in an inner box with the little white booklet, which is inside the newer mid-size packaging from US Games. Also included is a glossy A2 fold-out spread sheet which has a coloured diagram of the medicine wheel with its 36 positions, each numbered and titled, plus the three extras, the ‘power stones’. The backs are non-reversible and quite busy. The central part has a wheel design with the four power animals at each direction (bear, buffalo, eagle, and wolf). The top has the text ‘Spirit of the Wheel, the base has ‘All My Relations’. The layout is quite similar to the front of the cards and occasionally hard to pick out a reversed from a non-reversed at a glance. The faces of the cards are similarly packed, with the title at the top, three keywords and the number at the bottom, a central scene and two objects from the scene pulled out and symmetrically placed at the bottom left and right. The booklet introduces the deck’s concept and creators, and then gives rituals – visualisations – for each of the directions. The section with interpretations gives some keywords, a ‘prophecy’ to help you realise the direction for change or growth, and a prayer: an affirmational paragraph calling on the Great Spirit. There are also three original spreads of seven or eight cards apiece, and a method of spreading the cards to select a single card. I found it best to use these cards singly, rather than in readings, and to concentrate solely on one message. 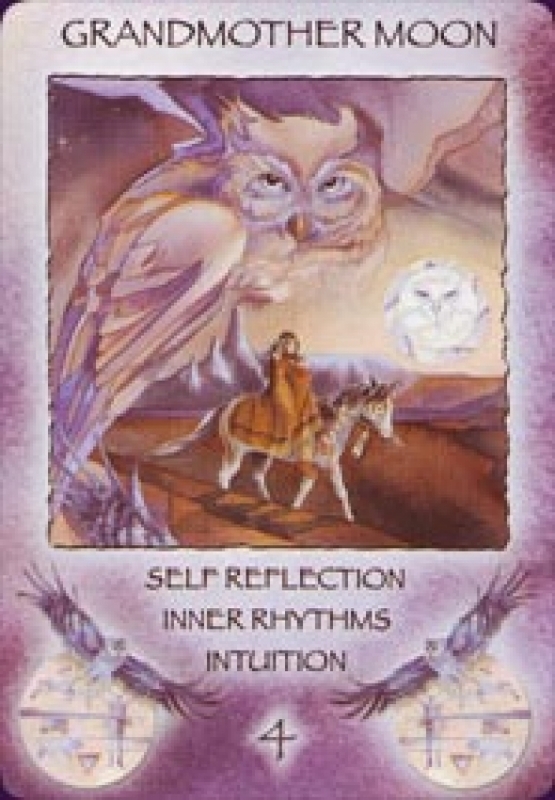 A multiple card reading is too much and too busy for me, and the uniformly positive messages on the cards make it hard to get an accurate picture of a situation in a reading. It’s best for those who feel an affinity with Native American spirituality and prefer decks that are solely for meditation or inspiring daily affirmations.